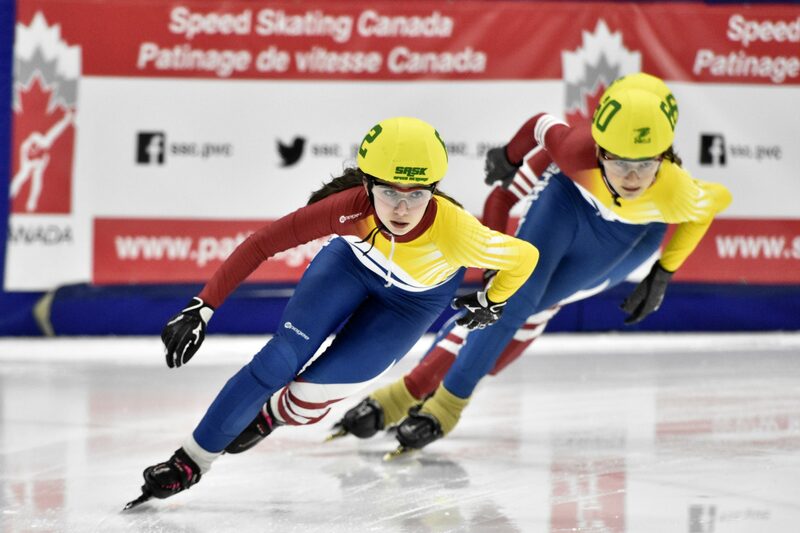 As you may have noticed, there have been some significant changes to Regional (Western Canada) and National short track competitions this year. There have also been some changes to previously-published information and dates. I wanted to explain some of the changes and how they affect our BC Performance Stream skaters. Most of this information is taken from the SSC HP Bulletin #179. If there is a discrepancy between what I have stated and what is in the Bulletin, assume that the Bulletin is correct. The message below is long, but important, so please read carefully. Canadian ST Championships (September 21-23, Montreal): this event replaces the Fall World Cup Selection Trials. It is limited to 24 skaters per gender, and new this year features some NextGen skaters (read more about NextGen here). This competition selects the Racing Pool, who will be eligible to attend World Cups. WEC #1 (September 28-30, Calgary): this event is similar to previous years. Note the date has been changed by the Calgary Olympic Oval to the last weekend in September as opposed to the first weekend in October. This is the last qualification competition for the R2RD Ranking, to qualify to the TEAM BC ST Selection Trials. CWG Test Event (October 13-14, Red Deer): this event is the official Test Event for the 2019 CWG. It will feature a division for the Team Alberta Selections #2, a division for the TEAM BC ST Selections Trials, and an Open division. Note that the previously-planned TEAM BC ST Selections Trials in Kamloops in November have been cancelled. ST Canada Cup (November 16-18, Laval): this event is very similar to the National Qualifier event that has historically been held in November. Although there were initial rumours that this event was for experience only (i.e. was not part of a qualification process to other national competitions, nor ranking), the competition is now confirmed to be the selection for preselected positions at the Canadian Junior ST Championships. There are 60 positions available (per gender) for this competition, including up to 50 from last season’s senior and junior rankings. The remaining spots are by time, skated between August 1st and October 15th. Competitions that may provide good opportunities to skate qualifying times include WEC #1 and the CWG Test Event. Canadian Junior ST Championships (December 14-16, Calgary): this event is very similar to previous years, with 32 skaters per gender. The majority of skaters will be preselected based on: juniors who skated at the Canadian ST Championships and those who ranked at the ST Canada Cup. There will be two positions available by time. Note that in previous years, the WEC #2 has been held on the same weekend as Canadian Junior ST Championships. WEC #2 is not being held this year, with the hopes of making a return next season. The Richmond Oval will be hosting a 1-day “Performance Interclub” on December 15th; details TBA. Canadian Winter Invitational (January 11-13, Montreal): this competition is for skaters to gain racing experience (i.e. not part of a qualification process to other competitions, nor ranking). International skaters will be invited, with the field limited to 32 skaters per gender. Entry is based on the Canadian ST Championships and the 2017-2018 senior ranking. Canadian Open National Qualifier (February 1-3, Montreal): this competition qualifies skaters to the Canadian Senior Selections and the Canadian Junior Selections in March. There are 60 positions per gender available, including skaters from Canadian ST Championships, the 2017-2018 senior ranking, the Canadian Junior ST Championships and remaining positions open by time. Times must be skated between August 1st and January 7th. WEC #3 (February 1-3, Calgary): this event is similar to previous years. It may be a fine-tuning event for skaters who have qualified to Canada Winter Games. Canada Winter Games (February 15-23, Red Deer): this event will feature skaters from across the country. The speed skating events are held during the first half of the Games (dates as indicated above). Skaters qualify to TEAM BC via the TEAM BC Selection Trials in October. Canadian Senior Selections (March 8-10, Calgary): this event features 32 skaters per gender, including the Racing Pool, skaters who attended the World Junior Championships and skaters from the National Qualifier. Junior skaters who meet the qualification standards will participate in this competition, but not the Canadian Junior Selections. With the exception of those skaters on the team at World Championships, the result of this competition dictates the 2018-2019 senior rank. Canadian Junior Selections (March 15-17, Sherbrooke): this event features 60 junior skaters from National Qualifier and Canadian Junior ST Championships (except those who qualified to Canadian Senior Selections, above). Remaining positions will be filled by time, with times skated between August 1st and February 18th. Final ranking at this competition determines the 2018-2019 junior rank, with any junior skaters who participated in the Canadian Senior Selections ranked ahead of those participating in the Canadian Junior Selections. If you have more questions, or a specific question for your situation, please don’t hesitate to reach out to me at: chris.acton@nullbcspeedskating.ca or via phone: 250-300-9908.